What are the limits of empathy? What are the boundaries of our self? What color is the darkness of our soul? Where does fear exist? The Poetics of Space, the seminal work of French philosopher Gaston Bachelard (1884 – 1962) mixes poetics, illusion and common images to localize some of our most abstract self-concepts. I should like to give the name of topoanalysis to this auxiliary of psychoanalysis. Topoanalysis, then, would be the systematic psychological study of the sites of our intimate lives. In the theater of the past that is constituted by memory, the state setting maintains the characters in their dominant roles. Bachelard’s preferred sites quite intimate and known – thus accessible – to any person reading his work. A home, something Bachelard argued we created wherever we went (and which I argue is often a misleading memory), is his primary image. The great function of poetry is to give us back the situations of our dreams. The house we were born in is more than the embodiment of home, it is also an embodiment of dreams. Each one of its nooks and corners was a resting place for daydreaming. And often the resting place particularized the daydream. Bachelard’s “topoanlysis” went beyond simple metaphor and worked through what he called “poetic space.” Where a metaphor (our imagination is like a house) falls flat, the poetic image (our imagination exists in a form we know as a house) flexes to meet our complex psychoanalytic needs. And every retreat on the part of the soul possesses, in my opinion, figures of havens. That most sordid of all havens, the corner, deserves to be examined. To withdraw into one’s corner is undoubtedly a meager expression. But despite its meagerness, it has numerous images, some, perhaps of great antiquity, images that are psychologically primitive. To read and enjoy Bachelard’s work takes a great deal of patience and mental visualization. For example, his statement that a poet will “seek warmth and the quiet life in the arms of a curve” had me picturing Emily Dickinson on a swing. It takes special conjecture to move further. One has only to look at pictures of ammonites to realize that, as early as the Mesozoic Age, mollusks constructed their shells according to the teachings of a transcendental geometry… A poet naturally understands this esthetic category of life. Novelist Penelope Lively would have loved that, one of her favorite things were ammonites, not for the transcendental curves but because they housed her memories. I don’t want to mislead you, this book doesn’t answer the questions I proposed in my introduction. But it does provide tools to help visualize and “place” certain feelings and imaginations. Poetics is all about cultivating, housing, storing, protecting and accessing the imagination and the emotions tied to imagination. 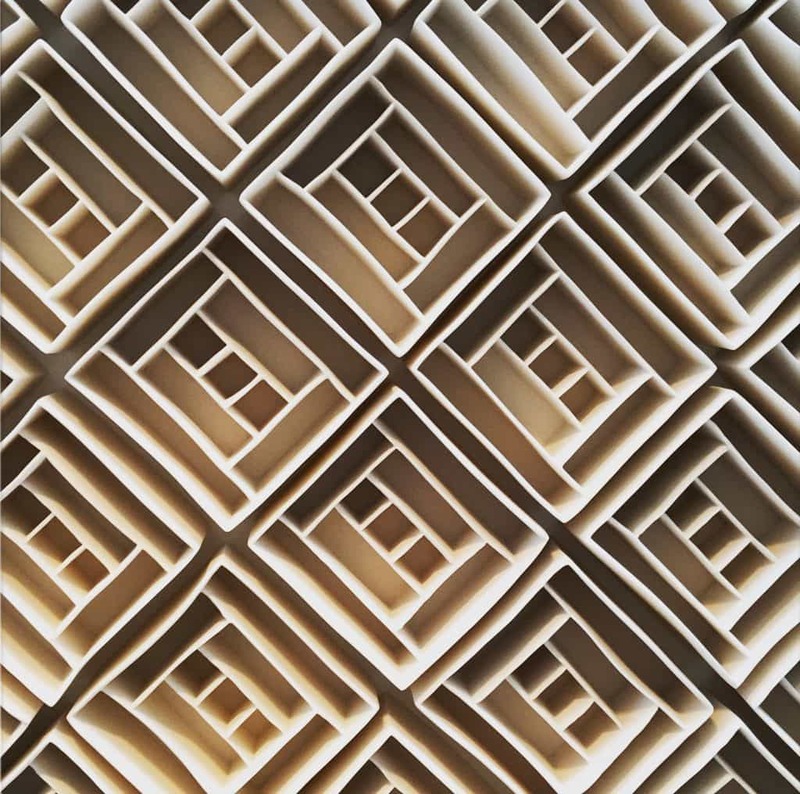 When Irish ceramic artist, Isobel Egan says her porcelain structures are about memory, I know exactly what she means. (Bachelard was an influence on her work). “Palisade” by Isobel Egan. Photograph by Ellen Vrana. Why does it matter? Why do we need to localize, contain or even imagine things like memory? For understanding. A different facet of anything helps us gain perspective – literally – and thus, understand notions that might otherwise overwhelm and be ignored.